We the Indigenous People of Biafra (IPOB) worldwide under the command of Mazi Nnamdi Kanu do hereby wish to register our displeasure at the inability of Nigeria's Attorney General and Justice Kafarati to be in court today in the matter IPOB vs FGN regarding the designation of IPOB as a terrorist group in an exparte order obtained without our lawyers present. It took the Attorney General of Nigeria, Chief of Defence Staff, Nigerian Army, South East governors and Ohaneze Ndigbo less than 30 minutes to obtain their black market ex-parte order proscribing and designating IPOB a terror group. Today at the same Federal High Court Abuja, the same judge in the person of the Hausa Fulani Islamic Justice Kafarati has run away from hearing the case he himself fixed for hearing this morning, knowing fully well the world is waiting for the outcome of his considered judgement given that he now has the opportunity to hear from both parties. Nigeria was quick to label IPOB a terror group but cannot come before the same court and judge to defend their wild accusations because IPOB lawyers came prepared with facts that would have led to the dismissal of Justice Kafarati as a High Court judge. All those legally ignorant people in Nigeria, jumping up and down with joy when the corrupt Justice Kafarati issued his decree in his chambers tagging IPOB a terror group, where are you now to tell us why IPOB should not be heard in your own law court. Black market jungle justice is what badly educated judges like Kafarati has turned the Nigeria Judiciary into. Nigeria has now formed the habit of either running away from the law court or using indefinite adjournments to frustrate any trial they know they are going to lose. As they failed to appear before ECOWAS Court sitting in Abuja in the matter Kanu vs FRN last week, again today the judge himself- an APC pro-government judge for that matter, has failed to show up in such an important high profile case with global significance, in the hope of using adjournment after adjournment to frustrate the only opportunity IPOB has to prove to the world that it is not a terror organisation. This lying APC Government think they are smart. As usual the Buhari government asked Justice Kafarati to stay away from court today and in its stead leaked the counter affidavit to the motion filed by Abaribe's lawyer demanding the Senator produce Kanu to the public. This APC Government gimmick of seeking to always divert attention away from topical issues is becoming worrisome. They designed the news headline today in readiness to divert public attention away from the non appearance of Justice Kafarati in court. Unfortunately this has become the norm for this morally bankrupt Buhari administration. A government that actively engage in lying and deception should not be entrusted with the protection and preservation of the process of the rule of law. With newspaper headlines screaming "Kanu is in the custody of Abaribe" they hope to divert focus away from the disgraceful non appearance of Justice Kafarati to Senator Abaribe suretyship. A very clever ploy of using manufactured sensational news stories to kill public interest in genuine cases of concern to the people. Welcome to legal practice in Buhari's Nigeria. The UN, USA, EU, UK, France, Israel and Russia must demand from Buhari why this judge ran away from hearing this suit. It was Nigeria that single handedly, without any evidence, court hearing or legislative backing, declared IPOB a terror group. Since the laws of Nigeria, or what is left of it, allows IPOB to challenge such draconian order in a court of law, Buhari and his Attorney General should be honorable enough to allow due process rather than asking the judge to skip his own hearing. 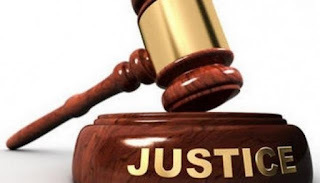 According to an eye witness in Abuja Federal High Court today, "I entered inside the court this morning with Barrister Maxwell Okpara, only to be informed that the same judge(Abdul Kafarati) that granted the prayers for the proscription of IPOB has postponed the matter to a later date. Okpara said the man is obviously running away from the case. We're now waiting for the Court clerk to pick another date of adjournment." Given the hopelessness and inability of the National Assembly in Nigeria to rein in the excesses of this Buhari regime, the international community is morally obliged to impose limited sanctions on Nigeria for this brazen subversion of the rule of law and undisguised dictatorial tendencies which breeds instability. They have made it impossible for the common man to view the law court as a place to obtain justice in Nigeria. All IPOB is asking for, is an opportunity to prove before a court of law that IPOB is not a terrorist organisation. Anthaison chuyên máy đưa võng cho bé với máy đưa võng ts tốt không hay tìm hiểu võng điện giá bao nhiêu hay máy đưa võng TS võng điện cho bé giá bao nhiêu thị trường hiện nay.